UnitedHealthcare CEO Steve Nelson (left) joins Sacramento Sheriff's Deputy Joe Gordon (center) and UnitedHealthcare Pro Cycling team member Luke Keough (right) to give third-grade students at Howe Avenue Elementary School new helmets and discuss bike safety and healthy lifestyles during a National Bicycle Safety Month event in Sacramento ahead of the final stage of the Amgen Tour of California (Photo: Shannon Rosan). 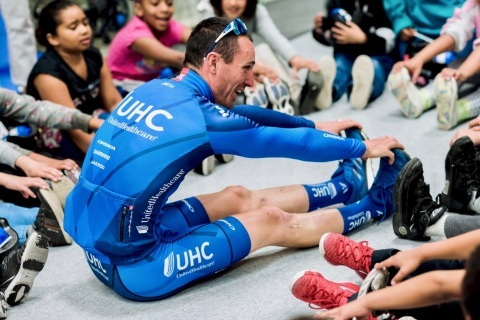 UnitedHealthcare Pro Cycling team member Luke Keough demonstrates some easy stretching exercise as part of a National Bicycle Safety Month event at Howe Avenue Elementary in Sacramento. Third-grade students at Howe Avenue Elementary received new bike helmets donated by UnitedHealthcare along with bike safety lessons in advance of the Amgen Tour of California final stage in downtown Sacramento (Photo: Shannon Rosan). SACRAMENTO, Calif.--(BUSINESS WIRE)--UnitedHealthcare pro-cyclists teamed up with the Sacramento Sheriff’s Activity League and the Sheriff’s Bike Unit to donate new bike helmets and provide bike safety demonstrations to third-grade students from Howe Avenue Elementary to encourage healthy, active lifestyles. UnitedHealthcare Pro Cycling team member Luke Keough discussed nutrition, the benefits of exercise and bike safety with the students, while encouraging them to attend and cheer on the pro-cyclists during the grand finale of the Amgen Tour of California on Saturday, May 19, in front of the Capitol Building in downtown Sacramento. 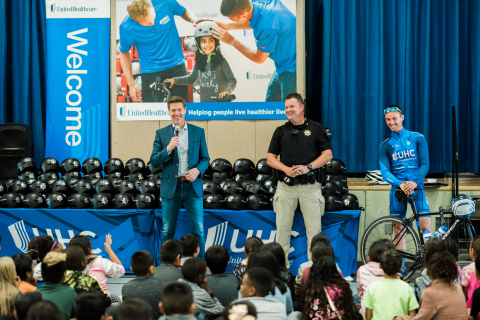 Members of the Sacramento Sheriff’s Bike Unit, UnitedHealthcare mascot Dr. Health E. Hound and the pro-cyclists also helped each student choose their helmets, led healthy stretches and provided bicycle safety demonstrations. Each student had the opportunity to personalize their own helmets with colorful stickers and decals to encourage them to wear their helmets when cycling. Learn more about the UnitedHealthcare Pro-Cycling team at www.uhcprocycling.com. UnitedHealthcare Pro Cycling Team and Howe Avenue Elementary School prepare for the Amgen Tour of California to encourage healthy, active lifestyles.